If not booked at Pinganchorage.com.my, the shuttle bus departs from Hotel Mandarin Pacific, Chinatown - Petaling Street, Kuala Lumpur. Bus stops at Jerantut town before noon to allow passengers to take their lunch. Passengers will board another NKS shuttle bus at 1.30 pm to Kuala Tembeling Jetty and 2pm boat to Taman Negara. When in Jerantut, please feel free to enquire at NKS Office in Hotel Sri Emas, Jerantut for any assistance or questions. You can also make a booking (+ seat reservation) by clicking on the bus banner below. If not booked at Pinganchorage.com.my, the Shuttle bus departs from Hotel Sri Emas or NKS Cafe bring you to Kuala Tembeling Jetty (about 10km - 12km). From here it is a scenic 3 hour (approximately) boat ride up the Tembeling River to the Park's headquarters at Kuala Tahan. 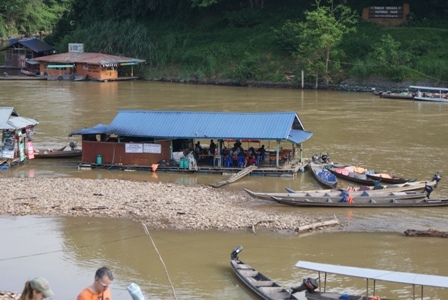 Other than boat, passengers can choose the bus direct to Taman Negara from Hotel Sri Emas or NKS Cafe. The new shuttle service organize by Father Guest House in Cameron Highland to Taman Negara will stop in Gua Musang before noon to allow passengers take their lunch and board to NKS Shuttle bus to Taman Negara. Bus stop over in Jerantut and allow passengers to bank get enough cash before to Taman Negara. (Taman Negara no bank and ATM). Ticket cost RM90.00 per person / way (bus ticket). The new shuttle service organize by Water Color in Kuala Besut Jetty to Taman Negara will stop in Gua Musang before noon to allow passengers take their lunch and board to NKS Shuttle bus to Taman Negara. Bus stop over in Jerantut and allow passengers withdraw money at ATM Marchine before to Taman Negara. (Taman Negara no bank and ATM). 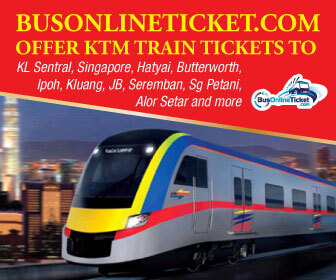 Click on the train banner above for reservation.